In today's fast-paced, instant-gratification world, people are juggling more, sleeping less and taking less time to just be. In fact, 42 percent of adults report that their stress level has increased over the past five years. More research is coming out tying our stress levels to physical ailments. Insufficient sleep has reached levels of a public-health epidemic. It's no wonder that more and more people are trying to find ways to ease their daily stress.Although mindfulness and meditation have been around for millennia, only recently has mindfulness entered the mainstream vernacular. Multiple studies have been published linking mindfulness practices to stress reduction, even decreasing our levels of the stress hormone cortisol. Meditation and mindfulness are now part of the toolkit of many licensed psychologists. It's been linked to easing medical concerns from irritable bowl syndrome to heart disease. Depending on whom you ask and what type of meditation they practice, you'll probably get a different answer to these questions. 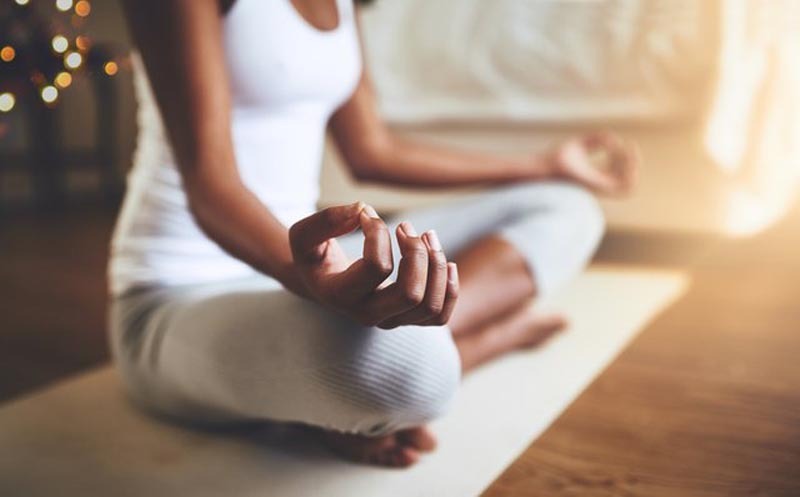 A common type of meditation called "mindfulness awareness" involves sitting comfortably in silence and bringing your attention to your breathing as a way to connect with the present moment. When the mind wanders, you practice gently bringing it back. I like to think of mindfulness as a combination of awareness and intention. So in this mindfulness-awareness practice, you are being mindful of your breath and of the present moment. 1. By creating a regular time and space to practice, I am giving myself a set time to sit down, slow down and do nothing. I am giving myself permission to be bored! During super-busy periods I even schedule it as an event in my calendar. 2. I practice not judging. All thoughts are treated equal in meditation. No matter what the content, when a thought arises during a meditation session, I just acknowledge it and gently come back to my breath. Even if the thought is about unicorns and rainbows, I come back. 3. I get to know my mind. I've been on longer retreats where after a while the same thoughts come up again and again. It's like I have one playlist on repeat. And that's when I start to realize that I've got some patterns that I tend to go back to. 4. I get to know my body. When you're just sitting for a period of time with no distractions, you start to notice how you're feeling in your body. After all, that's another thing (along with our breath) that's always with us, even if we try to ignore it! 5. My mind gets clearer. Often when I meditate, I start to feel more settled in my body and mind: It's like when you've shaken up a jar of dirt and water and the dirt settles to the bottom and leaves the clear water at the top. I often also feel more clear after I've gotten up off the cushion. Sakyong Mipham Rinpoche says, "The more we understand about ourselves and how our mind works, the more the mindcan work." 6. I'm on autopilot less. Or I catch myself when I'm on autopilot. Since I'm practicing being aware in the present moment with meditation, when I'm not meditating, it's easier for me to realize when I'm not present. Like when I get to my front door and forgot if I locked my car or can't remember what I had for breakfast. 7. I notice a space between emotions arising and my automatic reaction to them. In meditation, I practice noticing my thoughts and coming back to my breath without acting on them. So when emotions arise in my everyday life, I now have a greater ability to notice the emotion and what it's doing to me before I launch into an automatic reaction. Like when someone cuts you off on the freeway -- being aware of the urge to flip them off, then having the space to make a conscious decision about whether giving them the finger will actually help the situation. 8. I enjoy my food more. Seriously. I love food, but there are definitely times when my mind is on another planet while I'm eating, so much so that I'm barely tasting my food. Sound familiar? Now I know how to slow down, tune into my senses and enjoy what's going on right here, right now. All in all, meditating regularly has had a huge impact on my life. It's helped me to relate to my stress and emotions with more awareness and compassion. Although stress reduction was a goal that I had when I started meditating, now when I sit down on the cushion, I have no agenda. I'm just there to be me and to feel more at home in my mind and my body.